Our beautiful studio in the heart of Lancaster has everything you will need for your baby and family photography including car parking! Bathed in natural light, this is the perfect setting for your natural newborn or maternity portraits. And our studio’s unique features of spiral staircase and stunning windows add an extra element to portraits available nowhere else. Our range of backdrops and lighting systems also offer artistic studio alternatives where we can create stunning silhouettes or even a home from home in our wall papered setting. We have created a cozy and calming environment that we want you to relax in. You’ll be welcomed with a tea or coffee and will have plenty of space to spread out and enjoy your session. For the little ones waiting, we have a fantastic range of toys to keep them entertained, and a baby changing station with complementary nappies and anything else you might need. Our studio is cleaned daily and we are the local launderettes’ best client with all our throws and wraps going for washing after each session. 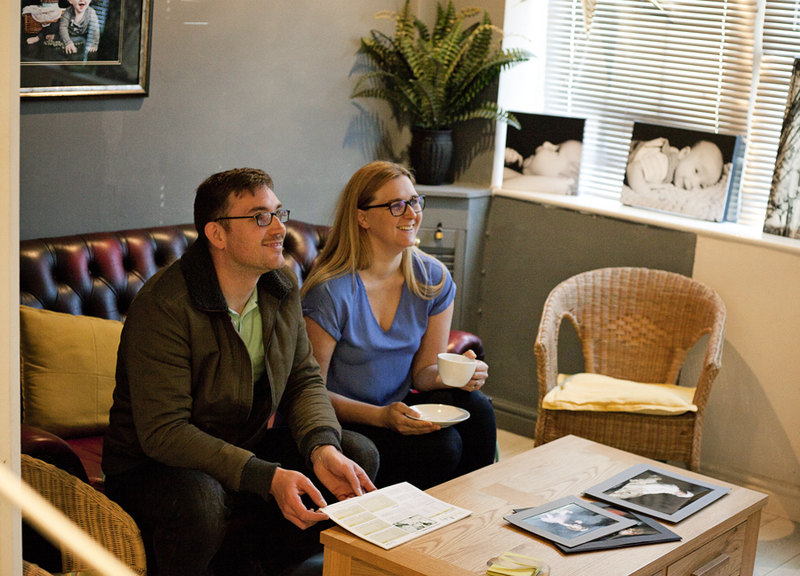 After your session you will be invited back for a cinematic viewing in our cosy viewing room. Seeing your portraits on the big screen is a wonderful, emotional experience and we always have the tissues to hand. We will show you samples of all the beautiful products we offer and handmade framing, and our user friendly software will help you to compare and choose your final portraits. Your photo shoot is only the beginning of the process of making your professional portraits. A huge amount of work goes on behind the scenes after you have chosen which images you would like. Each image is lovingly worked on and tweaked to perfection, removing dribble, rashes, milk spots and giving tired parents a gentle airbrush. Our post production work is a fine balance between using the technology to take away the elements that distract from the beauty of your images and ensuring that your images still remain natural looking.